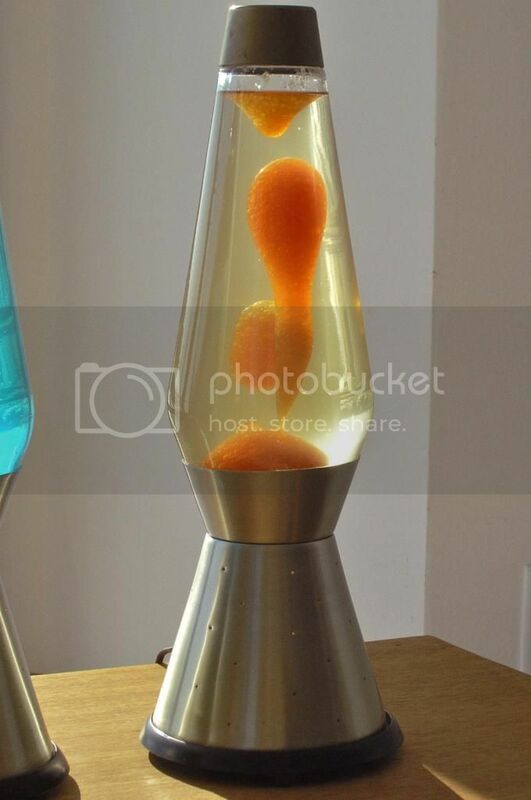 That looks like a 70s lamp. Try gently unscrewing the cap (when it is cold) and looking for a date tag there. I've seen that color combo occasionally but it is typically faded and often cloudy. Looks like you got a good one! Even the base has strong gold coloring left. That is a very pretty lamp! I've always been able to make out the date sticker by simply tilting the globe at an angle (when cold) and rotating the globe until the sticker is visible. Sometimes a flashlight is needed, but you can usually make it out through the glass. Then again, I'm one of those people who believes that a cap should never be removed unless it will save a life. I believe yours is from the 70s. For some reason, this is what I was expecting the vintage green/yellow USA lava lites to look like. I'm pretty sure the liquid isn't faded from something else to yellow, as it seems pretty bold and pigmented. Just like the shade of yellow usually used with red wax. But instead having olive green wax. Thanks for the info everyone. 70's is awesome! I can't wait to check this cap sticker, hoping for 11/1975. That lamp is awesome Erin, very different in liquid & base! Green wax/yellow liquid I've seen listed on old ads etc, but never reversed like that. And copperish base. 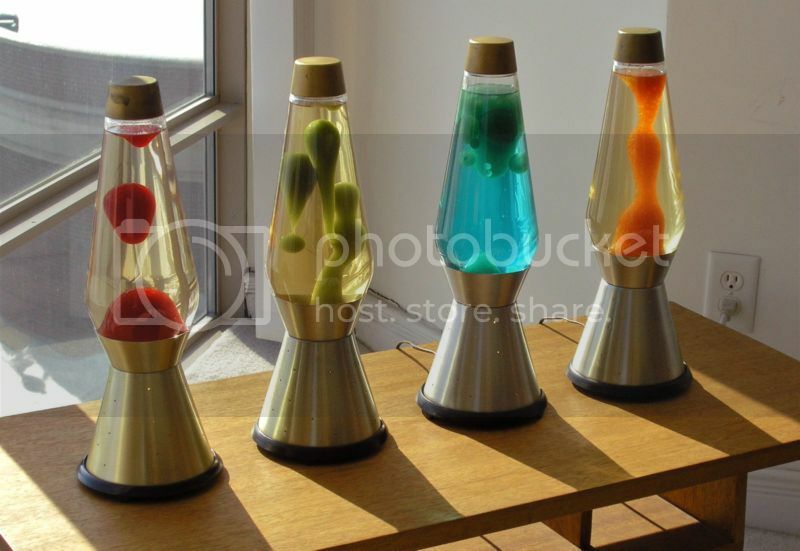 If I do start actually collecting vintage lava lamps, it's definitely going to be the centuries. Ha! I wish! That color combo from Mathmos is gorgeous! Yes, 11/75 would be my birth month/year too. Day 1. That is very cool Erin :) I've heard from another member here (who is way more knowledgeable than I) that he also believes it is a blue/green gone funky. But green/yellow was listed as an available choice back in those days. And how would blue liquid transform so perfectly into the color they used in red/yellow lamps? The lava doesnt look gross or lumpy or bubbly at all. High level/hasn't been run a million times. Does anyone have a bonifide genuine green/yellow example they can post a pic of? I'm having trouble letting go of this being an original color. Especially since it's an officially documented color combo AND I've seen so many blue liquid lamps that are still blue. This hobby is confusing me. I like that! I still don't see how blue could fade to that color. I think it's a yellow green, but yes, they do get kinda gross looking over time. I think the color is original... if only a little faded/used. It could be a wax dye leak over time that made the water yellowish looking but Im sure it was blue water at one time and if Im not mistaken the puke green lava and blue water is called Champagne Mist but not 100% sure. I was hoping for less speculation and more "gunner, the real green/yellow didn't look like that, it looked like this pic of an all-original, fresh minty green and day-glo yellow shown here" It is a company documented color combo of which I've still never seen a single picture of...unless this IS one? Stomach churning colors were very much a part of the 70's, it would go nice with a brand new avocado refrigerator & stove. It could be an over-used murky mess on arrival? But what I see in pics seems to be a crystal clear/terrific specimen, not a faded bubbly mess that curdled and screwed the liquid. This came from eBay, the seller had 4 old century lamps, all in different colors. Including a blue/green which appears to use a much lighter shade of green wax than is used in this green/yellow. And the green/yellow seems to be in the best condition and have the best flow, least fluid loss and best wax texture of the entire lot. Not used as much because it's kinda ugly? 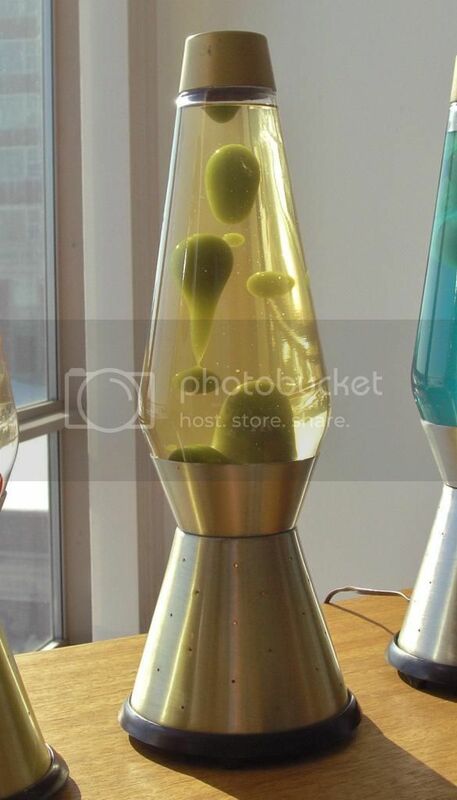 "It looks like a pulsating pea soup urn" But truth is, those pics could've been taken in 1994. Hopefully tomorrow I can actually see this thing!! But I'm liking the controversy, truly! Thank you goo heads! That orange one is awesome! But unfortunately the cap is broken and the wax is loaded with bubbles. I'm no surgeon ...yet, but geez with some glue and repeat cyclings it may work the air out? Too late now though, it's long gone. Each lamp sold for about $50 BIN. I think the blue/green is still available.